I saw this interesting little sign above a CVS while on a lunch time walk this week, and thought you might like to see it. 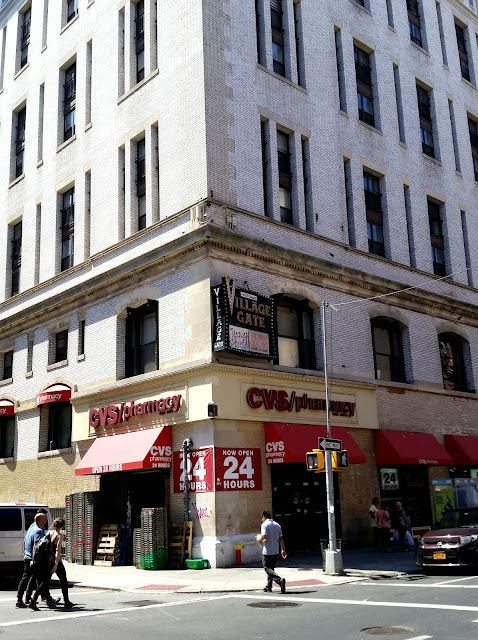 It's for the Village Gate, a nightclub that operated on the spot from 1958-1994. The Bleecker Street sign in Greenwich Village for the legendary music venue The Village Gate still stands, though the venue closed in 1993. Art D'Lugoff, the impressario on the sign, was the owner of the Village Gate from its opening in 1958 until its final closing in 1993. The sign still displays two placards, not from the Gate's final night as you might expect, but two of D'Lugoff's personal favorites, Jacques Brel and Penny Arcade. 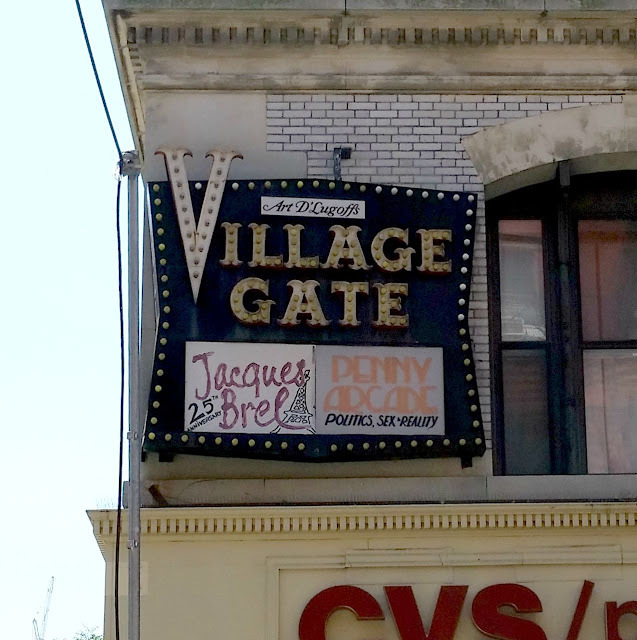 The Village Gate was a pivotal venue in the village music scene, having hosted shows for Jacques Brel, Bob Dylan, Richrd Pryor, Miles Davis, Ella Fitzgerald, Jimi Hendrix, Charlie Byrd, Thelonious Monk, and tons more. I'd stumbled into the theatre-building Rite Aid a few years ago, so it's interesting to see how many clubs have been turned into pharmacies. The lower level of this club continues as a performance venue, Le Poisson Rouge.